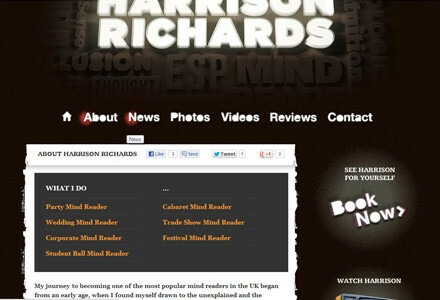 A Wordpress site built for Yorkshire magician Harrison Richards. A custom template built from the ground up to the designs of Leeds graphic designer Kris Howes. The site features a customised version of Thickbox, gallery and video showreel pages, a contact form with conditional jQuery routes, and a randomised testimonial feed. This is a custom WordPress site was built to the designs of Kris Howes, who also did the Cinema4D work on the main headers. I love working with nice designs and I do love this design. It uses the Google font Kameron throughout, and there’s a really subtle grunginess to some of the background images. The main menu took a bit of doing, it’s possible to add individual CSS classes to WordPress menu items using the WordPress 3.0+ menu system, but you’ve got to hack it all a bit of you want to use a combination of menu images and rollover/current-item images. I customised the Thickbox lightbox (which ships with WordPress) for the Next Gen Gallery, Harrison has since done a great job of blogging and optmising his site.